This book is one in the series of If You Give a Mouse a Cookie books. In this one they return to the original precocious mouse. It all begins with a simple trip to the movies. Yet while at the movies the mouse asks for popcorn, then he wants to string the popcorn together, and next he wants to put it on a tree. 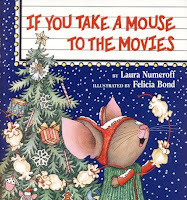 This is a wonderful book for the holiday season, as the mouse makes decorations and decorates the tree. Wonderfully illustrated and a fun story to read and share with little ones.